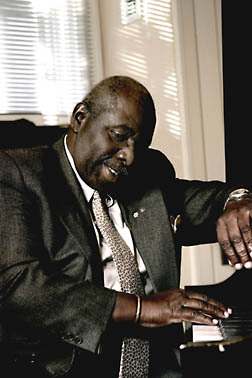 Oliver Jones, one of Canada's premier mainstream jazz pianists, is often mentioned in the same breath as Oscar Peterson, a neighbour and friend from the Little Burgundy area of Montreal where the two grew up. Musically, they are both blessed with a dazzling technique that stems from the training provided by Peterson's older sister, the legendary Daisy Peterson Sweeney. Despite these ties, both men will meet on stage for the first time ever on July 10 in a unique closing concert to the 25th edition of the Montreal International Jazz Festival. For Jones and his fans, the event is all the more special because he will be granting a rare performance since his retirement on January 1, 2000. Audiences the world over are aware of the pianist's rich voicings, percussive attacks, scintillating melodicism and infectious joy. Few, however, know of Jones's early musical life, one spent outside of the limelight. During a long conversation held just after the unveiling of the indoor concert schedule of the jazz festival, Jones reminisced on his career and talked about those who helped him along the way in his rich musical life. LSM: This is a very special event for you, because you are coming out of retirement. Oliver Jones: I'm really doing this because of the 25th anniversary of the festival. You see, I only missed the very first one. I've played the opening concert about seven times and have closed it just as often, and in about every kind of context as well. I've shared bills with Sarah Vaughan, Buddy Rich, Tony Bennett, just about everyone. I've played solo, duo, and trio, as well as with a big band and symphony orchestra. It's been a wonderful opportunity for me, and right from the get-go both Andre Ménard and Alain Simard (the festival bosses) had a lot of confidence in my abilities and gave me the opportunity to enjoy the limelight. LSM: It must have been a great experience to share the stage with the musicians you mentioned. OJ: Sure, those experiences were great, but so was the exposure, which always is the hardest thing for local musicians to come by. I spent probably the first 35 years of my life playing commercial music, but always listened to those musicians I would eventually get a chance to work with, which is a great satisfaction to me. Actually, I never thought I would get that opportunity and now, to top it off, I'll be there with my idol and mentor! For years people have wanted me to do something with Oscar and we've always said we would some day. The only thing is, as I told Oscar last year in Toronto, "If we do play, the only stipulation is that you only use your thumbs," because playing with him is like holding onto a tiger. LSM: You are often compared to Oscar Peterson, and you've called him your mentor. Did you consciously model yourself after him? OJ: Since we grew up in the same era, we both started out playing boogie- woogie and our styles evolved in similar ways over time, even if Oscar always played everything better than anyone else. He has been my greatest source of inspiration, without question, and I'm very proud to know that someone who lived just a few doors down from me has done so well. LSM: You have done very well yourself. Your career seems to have had three distinct phases: the earliest one you spent in Montreal, then you were musical director and piano player with a show band in Puerto Rico, and finally, you embarked on a career in jazz. Is this something you planned? OJ: Not at all. What happened was, when I was 16 or 17, I started to play clubs and hotels on a regular basis. From that point I decided there would be an opportunity for me to become a professional. In those days, it was possible to play jazz, but you mainly accompanied singers and dancers. Not only were we doing well and getting steady money, but it was also a learning experience and a kind of a growing up period I enjoyed very, very much. One of the first opportunities I really had to play jazz was downstairs at Rockhead's Paradise back in 1963. Then, through a mutual friend, I was introduced to a calypso singer named Kenny Hamilton, and I eventually became his musical director for 19 years. I toured all over with him, mostly in the Caribbean, but also throughout the States. That too was a great learning experience; it gave me the chance to work with a lot of singers and even to do some writing. I'd meet lots of musicians and play some jazz when I was in New York, Las Vegas, or Chicago. We'd play our show first, mostly hit parade things, and it was great, but after our gig we'd go out to the jazz clubs to listen to others, and I'd dream that maybe one day I would be doing that, too. LSM: Turning to your jazz career now, how did your collaboration with Justin Time start? OJ: I came back to Montreal in 1980. At that time, I was recovering from an operation to keep me from losing my right eye, and Charlie Biddle visited me at the hospital and told me that my friend, the late Stan Patrick (a wonderful piano player), was going back to teaching, so he asked me to take his place. I couldn't do very much on account of my medical problem, but Charlie said, "Come on and play," though I told him I had not played jazz for a long time. But he insisted and said, "You've always been a jazz piano player." After our first year as a duo, the club Biddle's opened its doors and we became the house band. By 1982, it had become very popular, and the greatest revelation to me then was seeing people actually coming to listen to us play jazz. I felt very privileged to finally have the chance to sit down and play what I wanted. Now, Jim West (the founder and producer of Justin Time Records) happened to be among the customers, and he seemed very impressed, too. At that time he was talking of starting up a jazz label, and to me he seemed like a kid, he looked like he was 16 or 17 years old. But when he came back the second time, I saw he was serious. So we started to talk and before I knew it he wanted to do a solo album, but I said I was not confident enough, and I never liked me to play solo anyway. I rather wanted to do it with the trio I had with Charlie and drummer Bernie Primeau. So that's what happened, and he asked me to sign for at least two more albums. To me, my relationship with Jim has been just as good as with the jazz festival. The label has grown and he is now one of the most sought-after producers in the business because he has such a great reputation among musicians. LSM: I notice that your repertoire revolves mostly around standards. What's your attraction to those tunes, as opposed to bop numbers or more modern ones? OJ: I love a lot of the bebop things, but they're very repetitious. Other than the melody itself, there are not a lot of things that I find I can work with. When it first came out I was enchanted by it and tried to do everything in a bebop style, but I find that I love ballads more than anything else, those beautiful tunes of Gershwin, or Cole Porter, or the gorgeous jazz writing of Duke Ellington. I can always get into those things. LSM: It's always interesting to know what kinds of music musicians listen to. OJ: I usually listen to classical music. Mind you, I have hundreds of jazz CDs at home, but I still listen to classical music 80 per cent of the time--Bach, of course, and Chopin's waltzes. Classical music was a very important part of my upbringing; it has given me a lot of the technique I needed. And when I prepare for a jazz concert, I wind up playing more classical things to get myself in shape. LSM: Of the 16 recordings you have done, which are you most proud of? OJ: Actually, something I had wanted to do for so many years was a big band album, and the chance to do From Lush to Lively (with the Rob McConnell Big Band) was very, very inspiring, so that's the one I really liked doing more than anything else. I liked it so much because it was not the usual format for me. The conditions were ideal, too, and there were wonderful arrangements by Rick Wilkins, a tremendous writer, and another Canadian we take for granted. We have so many great musicians here who never get acknowledged, and one of the things I've been doing since my retirement is to work with the DuMaurier Arts Council in helping out Canadian musicians. LSM: Speaking of retirement, are there any other things you're involved in now? OJ: I have done some benefit concerts for an organization called Giant Steps, which helps autistic children. I'm also involved with some community centres I grew up with and there I have an opportunity to give something back, like play a concert for the church where I grew up. LSM: Is there still something you haven't done yet, but would like to? OJ: I think I've done just about everything that I have dreamt of doing, including writing soundtracks for movies, which I've also enjoyed. LSM: Given your interest in classical music, would you consider doing anything more in that field? OJ: I would have liked to have done more, and I was even doing concerts with orchestras at one point. I've often wondered what would have been had I continued. I know my teacher always thought I had the potential to become a concert pianist. I think I missed the boat, because at the time, as a young black musician, I knew two or three others who also had the potential, but there just wasn't any opening back in the 1940s and 1950s, which is not the case now. But I can't complain. I think I've had a wonderful life, a rewarding career, and so I just continue to try to support and enjoy the festival, especially this one. I'll be 70 soon, so I don't think I will be around for the 50th, and even if I am, I'll be in the audience rather than on stage. 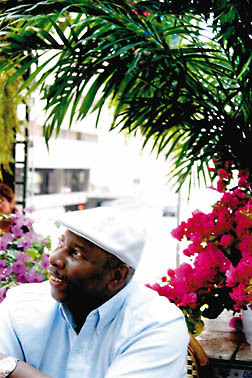 Oliver Jones is also the artistic director of the Jazz category of the Montreal Chamber Music Festival (June 4-26), www.festivalmontreal.org, and he is the consultant to Mr. George Durst at the House of Jazz, 2060 rue Aylmer, Montreal.